Howdy. It’s been a while, sorry about that. To make up for my absence I bring you cake. Well at least the idea of cake. Also, I missed Monday Cakes and this one has brown sugar butter cream, so it was fate. This comes from How to Cook Like Your Grandmother and besides being an adorable name they have some pretty fab recipes so stop by and say helllooo. Combine the sugar and butter and beat on low speed until completely combined. Add the egg yolks and beat on high speed until the mixture is smooth and fluffy. In a separate bowl, combine the dry ingredients — flour, baking powder, baking soda and salt — and whisk thoroughly. You’ll want the baking soda to be well distributed throughout the flour before adding to the wet ingredients. Alternate adding dry and wet ingredients (milk), beating each time until it is just incorporated. Start and end with dry. When you’re done, you should have a nice, soft, fluffy batter. Now mash the bananas and add them to the batter. Add the vanilla and beat until combined. Whip the egg whites until they form stiff peaks, but not so much you dry them out. Carefully fold the egg whites into the batter, trying not to deflate them too much. Pour the batter into three greased and floured round pans. Bake at 350° for 35 minutes, until a toothpick inserted in the center comes out dry. 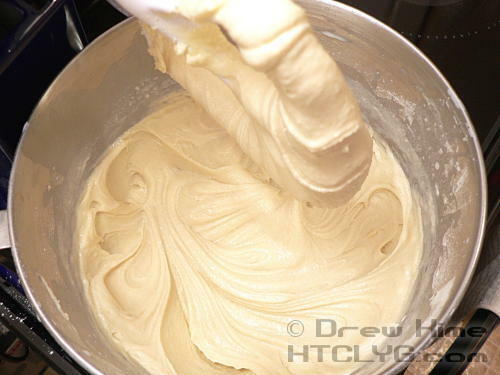 Stir the milk and flour together and mix over medium heat for 5-10 minutes, until it thickens. and you don’t taste the graininess of it any more. Add the milk mixture to the butter mixture and stir until smooth.